A 50 year old woman with a neurogenic bladder presented with hematuria and was biopsied. Histological Description: Many of the fragments show glands near the surface urothelium with cystitis glandularis of the usual type. In addition, there are many glands lined with goblet cells with bland basally situated small round nuclei. Some of these glands are associated with acellular mucinous pools and focally involve the muscularis propria. A few glands have diminished goblet cells where the nuclei are more cytologically atypical and have lost their basal orientation. 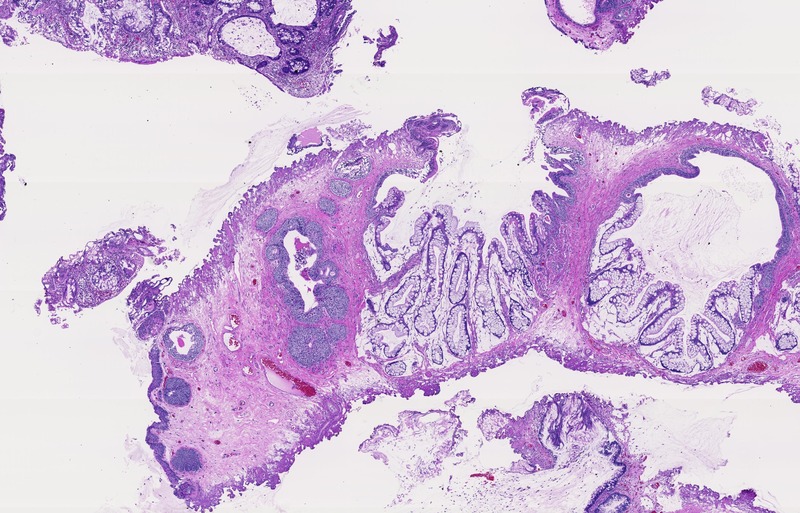 Discussion: Intestinal metaplasia is an unusual variant of cystitis glandularis and is identical to colonic type glands. It can make a tumor-like mass clinically and biopsied to rule out carcinoma. 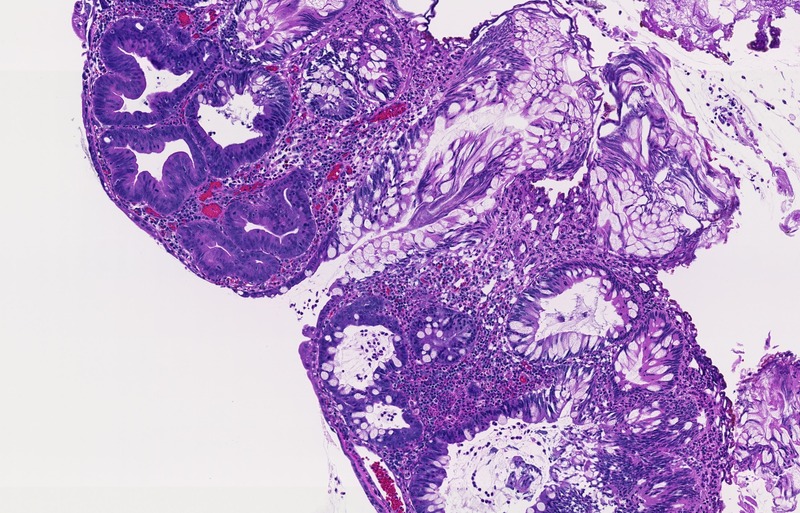 There are several features that can be seen within intestinal metaplasia that are histologically worrisome for carcinoma although has no prognostic significance. Acellular mucinous pools are common yet as long as the pools are not lined by cytologically atypical epithelium they are totally benign. Less commonly, glands of intestinal metaplasia can be seen in the muscularis propria but again does not mean they are malignant. 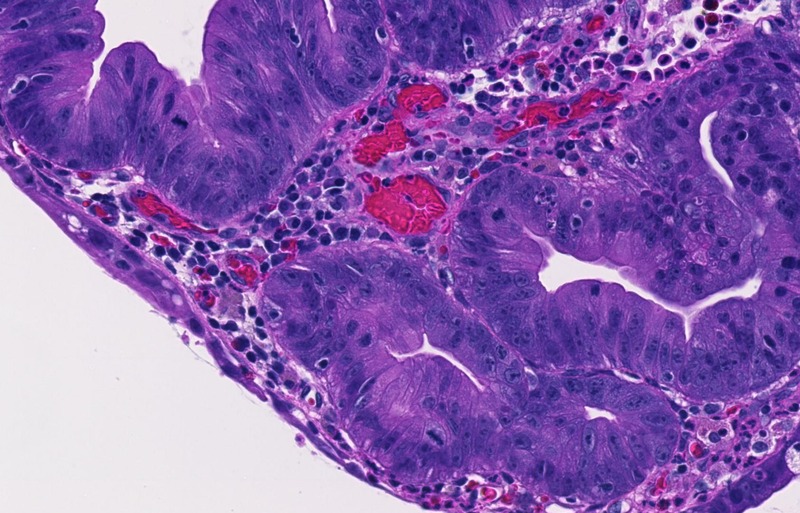 Intestinal metaplasia, although mimicking carcinoma clinically and histologically, is not associated with an increased risk of concurrent or subsequent carcinoma. Rarely, glands of intestinal metaplasia can have high grade dysplasia, analogous to what is seen in the GI tract, where there is an increased risk of cancer. In these cases, the clinicians should be encouraged to resect the entire lesion to rule out concurrent invasive carcinoma.